On the occasion of the 50th anniversary of Dr. Mossadegh's government, I took liberty to speak to my father, Nosratollah Amini, Mossadegh's confidante and personal attorney. Amini was the mayor of Tehran during that period and a member of the Iranian National Front. 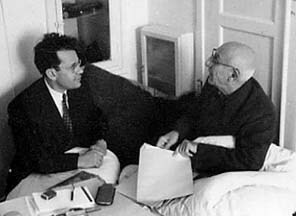 Aside from immediate family, Amini was the only one allowed to visit Mossadegh in his estate in Ahmadabad, about an hour and a half east of Tehran, where he was exiled by the Shah from 1954 to1969. * "I used to take care of his personal matters, his will, etc. Until the very last days when he was brought to Tehran from Ahmadabad for treatment. He had been diagnosed with cancer. I was at his bedside. He asked that he be buried in the cemetery where the martyrs of 30th of Tir were laid to rest. He wanted to be laid by the side of those who died for him. I asked the authorities for a special permission. Apparently the Shah himself refused the request. He was laid to rest in his hometown of Ahmadabad." * "One of his many qualities was his generosity and being down to earth. He was a person for common man. In one of the letters I have from him, which I treasure greatly, he said how much he despised being called 'Sir' or any other titles. 'Please do not refer to me as Sir, I dislike any such titles,' he would say." * "He did not want his picture to be hung anywhere. One day, when I had just started my job at the Tehran municipality, there were many pictures on the walls, including that of Reza Shah. We enlarged a photograph of Dr. Mossadegh and I took it to him to be signed. He became very upset. 'Please tear up this photo,' he said. 'I don't want anyone to make an idol out of me'." * "On another occasion, he asked me to go to his office. There was a lady present. Dr Mossadegh said, 'didn't I ask you not to name any street, alleys or squares after me? This lady claims that the municipality is going to enlarge this street called Mossadegh and as a result her home will be destroyed'. We went there and noticed that one of the streets leading to 24th Esfand Square (now called Enqelab), had been renamed Mossadegh by someone who used a piece of chalk. Dr. Mossadegh was satisfied only after we had cleaned the hand-written name." * "Whenever anyone would bring a gift to him, he would always accept it but immediately afterwards, if the gift was of any value he would donate it to one of the museums. If the gift were not of tremendous value, the first person entering the room would receive the gift. His close associates would know of this and would try to be the first to go to his office! At the same time, he would ask his assistant to write a thank you note to the person who had sent him the gift and would try to send a gift of similar value." * "Dr. Mossadegh's love for people manifested itself in many ways. A year before the famous 30th of Tir incident, the government headed by Dr. Mossadegh had to resign so that a new government could be elected. Dr. Mossadegh did not submit his resignation on the grounds that the Majlis was going to ratify certain licenses that were beneficial only to the export/import merchants. He resigned only after the licenses were rejected. He was always safeguarding the people's interest and looking for ways to serve them." * "When he was ill with cancer and was brought to Tehran for treatment, he was given permission to go abroad. He adamantly refused. He said, 'I am no different from any other Iranian and wants to be treated by Iranian doctors. I will stay in here and die among my own people'." * "On another important occasion, which took place while he was a member of parliament, the Tudeh Party faction introduced a resolution to abolish the D'Arcy oil concession accord. They told Dr. Mossadegh of their attempt and wanted his approval. He refused to endorse it. His argument was that the majority in the Majlis was pro-British and if this was introduced it would surely be defeated. 'Let the emotions of people rise and they shall defeat the oil concession accordingly,' he said." * "Prior to the CIA coup of 1953, Kianouri of the Tudeh Party came to visit Dr. Mossadegh and warned of a coup being organized against him. Kianouri asked for arms to crush the coup. Dr. Mossadegh's reply was, 'The hands of a prime minister who would arm anyone to kill the people, should be cut'." * "Judge William Douglas, who was one of the U.S. Supreme Court justices at the time, upon his visit to Iran and meeting Dr. Mossadegh, became one of his many admirers and supporters. He later wrote, after the 1953 coup that the U.S. government made a grave mistake towards Dr. Mossadegh. He was not a leftist and he did not have any affiliation with the communists. He was a nationalist in the true sense of the word. Judge Douglas remained a close friend." * "In an incident in the Majlis, when he was told he could not speak, Dr. Mossadegh came out and in front of the Baharestan Square, stood on a stool and declared, 'This is the real Majlis, where the people are, and I will speak right here among the people!'" * "During his whole tenure as premier, he never accepted any salary and paid for his own trips and his companions on their travels to the United Nations and The Hague. And even when the tax administration had noticed that he had overpaid his taxes on the land he owned, he refused to accept anything in return!" * "Dr. Mossadegh was the true representation of modesty, humility and integrity in government. He believed and advocated true democratic principles for Iran. He was the people's premier. That is the reason why after more than five decades, Iranians consider him the most beloved statesman of Iran. May his path and ways be an example for Iran's future politics."